Blue Leg Hermit Crabs (Calcinus elegans) are one beautiful looking creature. This crab has electric blue legs with deep black bands and the antenna are orange in colour. Both the claws are blackish green in colour. These crabs are living in shells similar to the ones which are on the snails. These little sea creatures are found in the Indo-Pacific region at a dept of 10 m on the rocky bottoms and rubbles. I got these in a size smaller than 2 inches. As a part of the clean-up crew these Blue Leg Hermit Crabs (Calcinus elegans) are pretty expensive compared to others. They immediately start attacking the green algae and cyanobacteria. You definitely need lot of empty shells in the tank or would see them stressing out the snails. It is difficult to talk about the size of the shells so, it would be great to put random size shells. 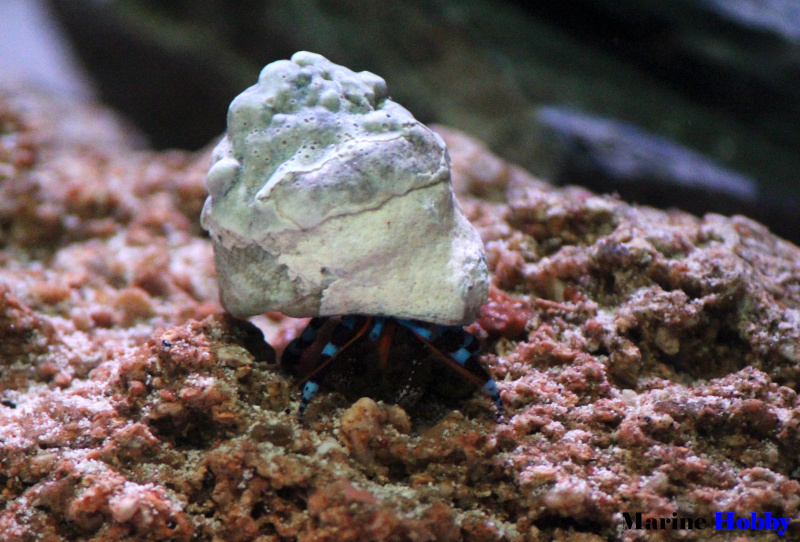 Blue Leg Hermit Crabs (Calcinus elegans) are easy, reef safe and hardy to keep. I don’t really target feed them in my tank. Have also seen them feeding on the left-over flake food in my marine tank. It is fun to watch these small guys going around the tank. It is a great addition to any marine tank I would say and of course they are bit expensive.